Oven Cleaners Home & Commercial Kitchen Chelsfield BR6 | Quality Property Care Ltd.
For a more professional touch, with guaranteed spotless results each time call 020 3746 4287 and let our company clean your entire kitchen. We work fast and efficient, no delays or complications, contract and deposit free. With our professional oven cleaning services in Chelsfield BR6, you are also free to book sanitising of all your kitchen appliances. You can combine it with another one from the cleaning services we offer. Thus, you will get a a discount. All regular customers get regular promotions, too. The cleaning is performed with children and pet safe, organic cleaning methods. Our detergents have antibacterial qualities, keeping your kitchen fungal-free. We use special detergent for fridges with a lasting effect but with no dangerous effects for your health or the food. We take apart any detachable parts and clean them one by one, removing any leftover food from them. The main body of the fridge is also cleaned thoroughly, removing any streaks, pieces of fruit and food from the racks. To remove unpleasant odours we use an odour neutralizing agent. All of the appliances are treated with proper detergents, all of which are eco-friendly and assure the safety of your family. Our trusted professional cooker cleaning company has 10 years of experience in the expert cleaning services. 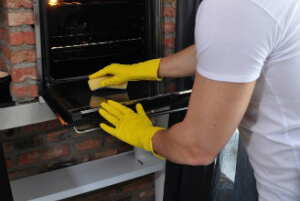 By using modern cleaning techniques and revolutionary sanitising devices we have developed the right formula for green, fast and flawless oven cleaning services in Chelsfield BR6. Upon request, Quality Property Care Ltd. technicians can also provide you with cleansing of your whole kitchen. If your kitchen needs only an oven cleaning service, we can offer you extra cleaning services for your property: carpet and upholstery cleaning, end of tenancy cleaning, window cleaning and more. Bare in mind: customers, who order more than 1 service at once get a special discount! Call our friendly customer assistants today! Free your oven from grime and bacteria! Make an order via the online booking form or give us a call today! Receive more information and get a free quote for oven cleaning services in Chelsfield BR6 now! Call us on 020 3746 4287 at the best time for you and we will arrange your fast and efficient visit!